At 14h38, Friday, 29th March, the SA Whale Disentanglement Network (SAWDN) volunteers were activated following reports from Francois Stapelberg, of African Eagle Marine Eco Tours, aboard their tourist boat Eagle 1, reporting to have come across a whale entangled in fishing rope, fishing gear and floatation buoys, 1.5 nautical miles off-shore of the Sea Point Pavilion. 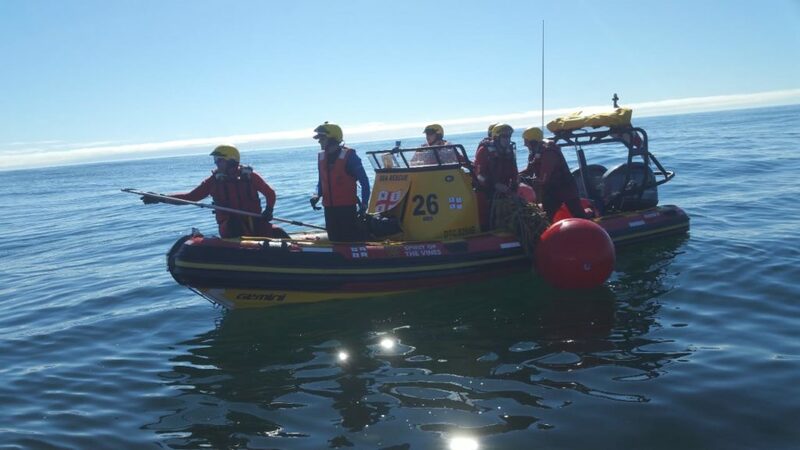 A sea rescue craft conducting sea trials in the area diverted to investigate and it was confirmed to be an entangled 10 meter juvenile Southern Right whale and SAWDN were activated and the NSRI were requested to assist with sea rescue craft. Francois had first alerted SAWDN to the same whale in February but despite an extensive search by SAWDN and NSRI no sign of the whale could be found. 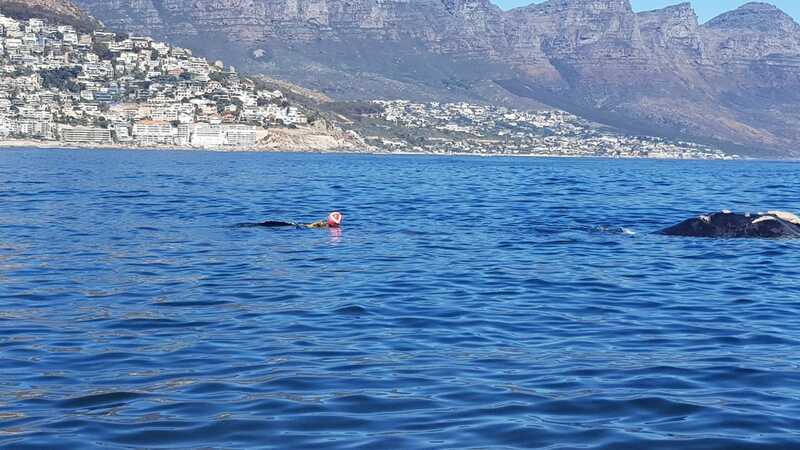 On 3 further occasions in February and in March sightings of the same whale had been reported in Table Bay, Clifton and up the West Coast but every time SAWDN and NSRI responded all attempts to locate the whale were unsuccessful. On 2 occasions a Girocopter was volunteered by Jean Tresfon to try to locate the whale but on both occasions no sign of the whale could be located. Today, after finding the whale, Francois had taken his tourists back to the harbour before returning to seek out the whale and he was able to locate the whale a second time today. 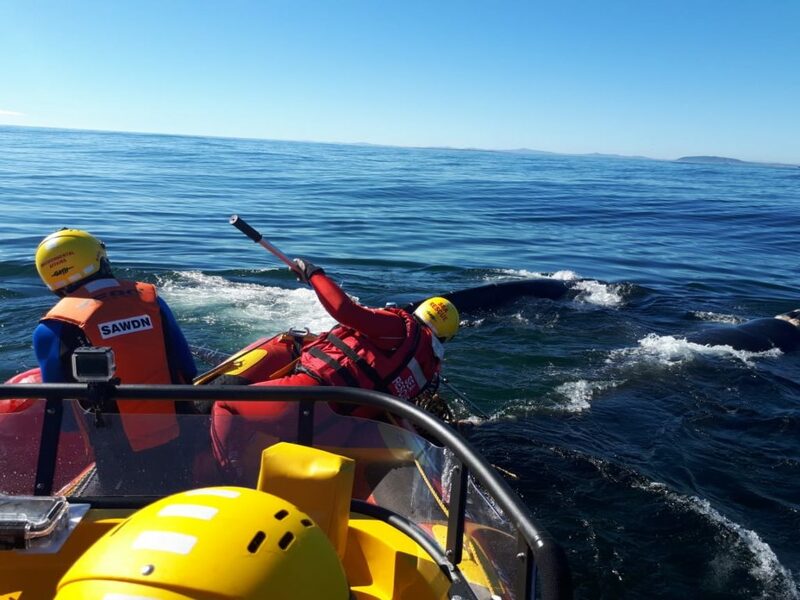 We also requested assistance from the Cape Town Boating Network and they had a member, who is also an NSRI spotter, locate the whale using a telescope from a residence high up of Sea Point, and a member who was launching his boat to go on a pleasure cruise had offered to assist in locating the whale. Having confirmed sightings of the whale today the NSRI Kommetjie sea rescue craft was launched accompanied by SAWDN volunteers and on arrival on the scene Francois was in attendance to point out the whale and it became evident why the whale had eluded previous search efforts for so long – due to a heavy clump of fishing gear wrapped around the whales tail in 6 entanglements forcing the tail to mostly lie under the water surface making it difficult to identify the entangled whale. 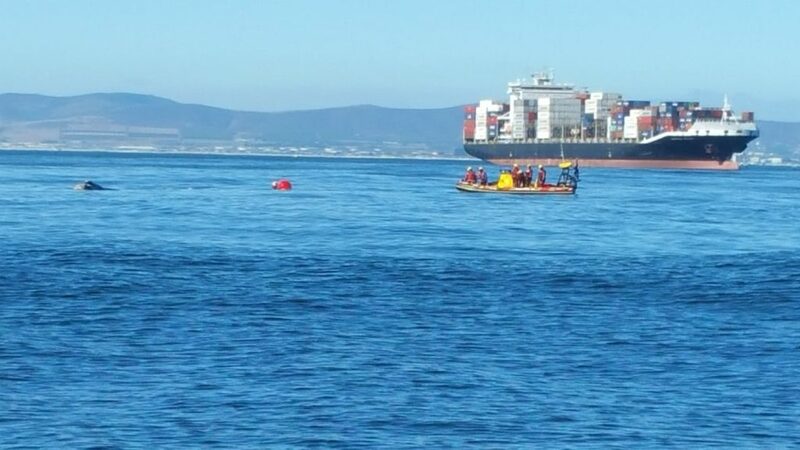 NSRI Table Bay and NSRI Bakoven remained on alert to assist. The whale was tired, said Mike Meyer of SAWDN, and 2 whales remained by the entangled whales side throughout the operation which always adds an element of emotion to these operations and we were determined to free the whale today having finally located the whale after so many previous unsuccessful efforts. Kegging lines were attached to the entanglement and using the specialised cutting equipment we set about cutting the ropes with 6 ropes around the tail harbouring a clump of fishing gear and floatation buoys and 3 ropes around the fluke. During the operation the whale dived under water a number of times and the close proximity of the other 2 whales made the operation challenging particularly because of the weight of the gear around the tail causing the tail to lie under water most of the time which made it difficult to determine which whale we were there to disentangle, said Mike. In an operation lasting about 20 minutes we were able to cut free all entangled lines and all of the ropes and gear and buoys were recovered for disposal. The disentangled whale, and its 2 companions, have gone on their way and we are confident of the affected whales survival following this ordeal and we are truly delighted with the successful operation, said Mike. SAWDN commend Francois Stapelberg for his involvement in locating this whale and all involved in the ongoing search for this whale and the operation today. 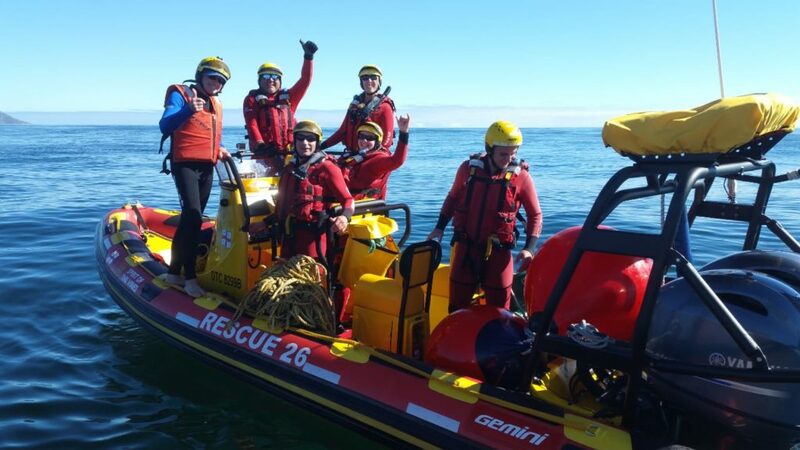 The South African Whale Disentanglement Network (SAWDN) was established in 2006 in order to manage entangled whales using specialised equipment and is comprised of trained volunteers from the – National Sea Rescue Institute, KwaZulu-Natal Sharks Board, Department of Environmental Affairs, Centre for Sustainable Oceans at the Cape Peninsula University of Technology, Cape Nature, Mammal Research Institute, South African National Parks, South African Police Service, Department of Agriculture Forestry and Fisheries, Telkom Maritime Radio Services, Cape Nature, Bayworld, various Boat Based Whale Watching and Shark Cage Diving Operators, the Rock Lobster Industry and the Octopus Industry and fully supported by the Dolphin Action and Protection Group.